A lot of the more well-known household brands have been dipping their toes in the water of the Interactive Touch Screen market. Microsoft with its surface hub product that was launched amidst a lot of hype and publicity (great for companies such as TouchIT!). Their hugely expensive product was surrounded in supply issues that consequently forced them to stop selling the product and the market is still waiting for Version 2 that is also currently unavailable. Likewise, Google Jamboard came to market in 2016 which we also wrote about on our blog why you don’t need their offering. For these huge multi-national, house hold name brands, the touchscreen market is an after-thought; it really is not what they do. They are PC builders, or Software Publishers, or Search Engine Giants – not specialist touch screen manufactures like TouchIT Technologies. Whilst we are nowhere near the size of these giants, we do have 10 years of experience in these products. It is our bread and butter. It is what we do and what we specialise in. In the case of the Dell 75 4K Interactive Touch Monitor (C7520QT), from what we can see, here are the reasons that you don’t need the product. 20pt Multi-touch – big deal? They are marketing the Dell 75 4K Interactive Touch Monitor (C7520QT) with 20pt multi-touch – honestly, this is not a big deal. Once manufacturers like ourselves launched 2 point multi-touch back in 2012, that was enough. All the gestures still can be done with 2 points – any more than this is just getting on the marketing band wagon. We are guilty of this ourselves and actually have a 10pt multi-touch TouchIT Y Series LED This model can do all of the “collaboration” that Dell are talking about with their statistics and more. We are also planning on launching a 20pt model later this year – again to keep up with the marketing hype as we don’t believe there is any real benefit in it. Just a point to remember here, we launched our TouchIT Fusion product with 32 point touch back in 2014! 20pt touch – nothing new! “Dell Screen Drop” – It’s just a height adjustable stand! Unless I am missing something, which I could be, well done Dell, you have put your marketing team hard to work to come up with a slogan for a height adjustable stand for the C7520QT! These again are nothing new and at TouchIT Technologies, we offer a range of the BalanceBox wall mounts and stands that are all height adjustable. We are able to offer electric height adjustable mobile stands, wall mounted version, manual versions and pretty much everything in between including our Fusion 2 product that takes your LED and allows you to move it flat like a table! What is also interesting about this approach is that they are assuming that all schools and educational establishments that are their target market for this product, actually want their screens to be mobile. At TouchIT Technologies, I would say that 95% of what we do is wall mounted. If their “push” is their “Dell Screen Drop” stand, then that would seem to be to the contrary of what the market, certainly our market, actually wants. The Price – $5999 – ouch! Following suit from the other tech giants, Dell has launched their “Education” product at a totally “non-educational-budget-friendly” price. Six grand a room! Ouch!!! I’m pretty sure that this is not a delivered price either and these things are not going to be light. You are going to be looking at a few more hundred dollars a unit for delivery to a school in the USA. So, let’s call that almost six and a half grand a unit! BIG OUCH! To give you an idea of how expensive this actually is – for quantity purchases from our leading resellers around the country, you would be looking at around $4000 delivered for a 75″ TouchIT Y Series. If you do have that six grand budget available, you would be able to get one of our 86″ models for the same price as a 75″ Dell C7520QT – bigger is always better in the touchscreen market. Availability – April 30 2019 – What about a demo / trial? Software – no details on their software! Collaboration does not come from the hardware. The Dell C7520QT hardware certainly does not do this. It is software, so how are they doing it? There is no mention whatsoever on their software and how it works. Now, being the specialist in this arena, TouchIT has its own collaboration software which is called Contribute Cloud. Here is what Contribute Cloud can do for you in the classroom. Take a PDF, Word Doc, Image, Google Sheets or Slides just to name a few and open them on your computer, with the LED, you can show them to your class. Open those same files in Contribute Cloud, and we cam make them collaborative, deliver them to students on their own devices and have a live shared workspace for annotations without having to change the files in any way. The holy grail of whole class teaching – the ability to cast and multi-cast up to the LED. Show your student’s screen live in real time on the LED without any wires, all through the Contribute Cloud software. Distance Learning tools for the teacher. This gives the teacher the ability to be inclusive for students that are off on long term sick and include them in the lesson, They can enjoy the same experience as their classmates from afar and participate as if they were in the classroom. They can both see and hear the teacher all through Contribute Cloud. Being able to send files and links to the students through the Group Chat feature is a huge benefit to the students. No need to email everyone, just elect your file or link and drop it into the chat session. We have calculators, periodic tables, pianos, dice, tally charts, “excel-like” tables and more in our software. All can be used in the workbooks and collaboratively with your students. 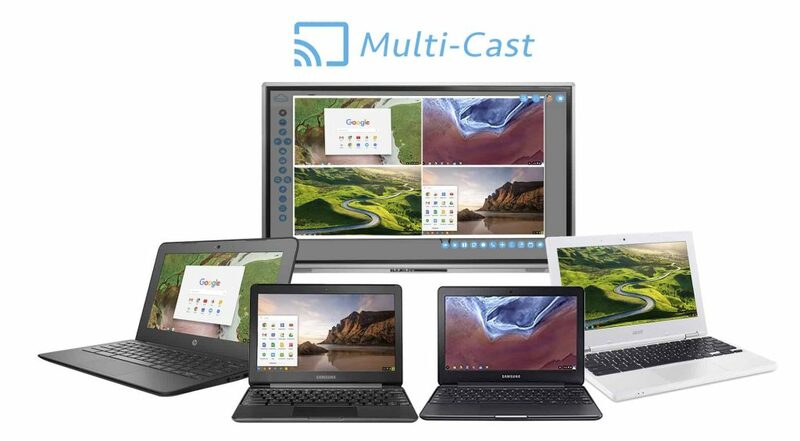 Built in PC – What about the Chromebooks? I understand that for many years, PCs have been Dell’s bread and butter. That said, they also have a successful range of Chromebooks. I don’t see that the addition of a built in PC as a huge selling point here. To give you an example, I would say that 90%+ of our users prefer to use their own computer instead of our built-in Android OS. People, especially teachers, like familiarity – don’t we all. I much prefer to be presenting on my own computer rather than someone else’s as I know where everything is. This is the same in the classroom – teachers prefer to take their computer (and I say computer here to encompass the growing amounts of Chromebooks in schools) with them from room to room. They will not want to be saddled with the added burden of using a computer that is not their own. Sorry Dell, that is another one of your selling features I disagree with. Check out my comments in-between the points here – there really is nothing new about this product. 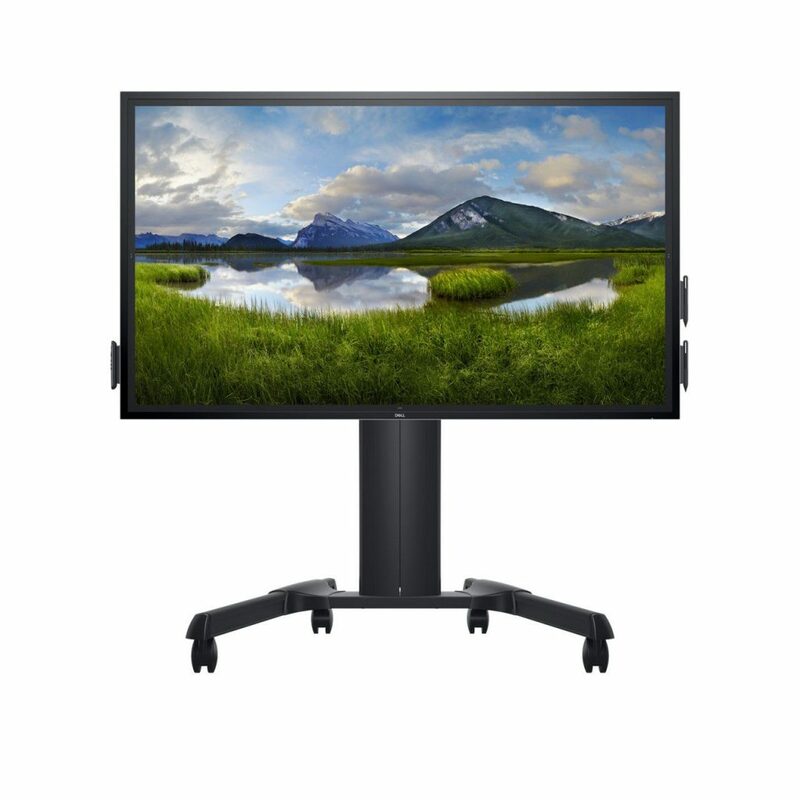 The wide viewing angle enabled by IPS technology allows for vivid and consistent colors across the screen to be seen from virtually anywhere in the room. TouchIT LCDs and LEDs have had a 178 degree wide angle view for the last 7 years! 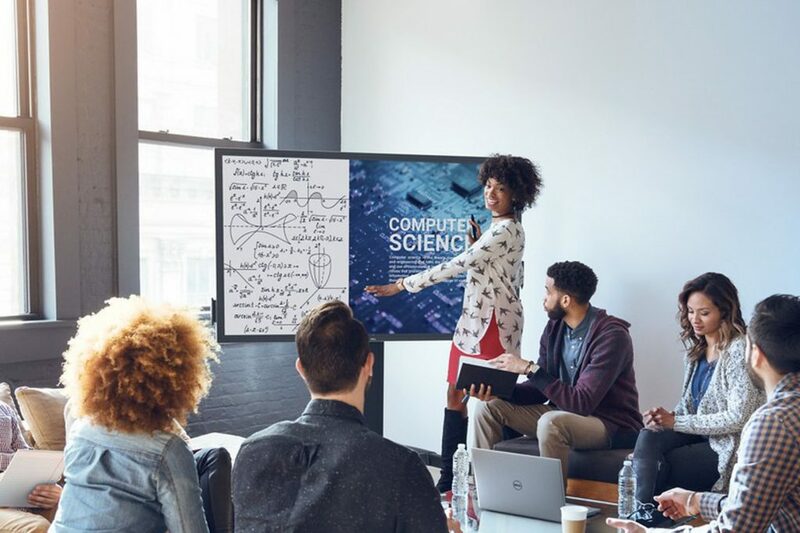 Dell monitor technology optimizes fonts and ensures visuals appear sharp while operating everyday programs like Microsoft PowerPoint, Word and Excel. I’m pretty certain Windows OS has been doing this for years! Anti-glare and anti-smudge coatings reduce distracting reflections and fingerprints while Dell ComfortView reduces blue light emission to optimize eye comfort. Yes, we’ve had Anti-Glare coatings since 2013 too! The unique design supports seamless integration of an optional Dell OptiPlex Micro PC into the display for an all-in-one solution that lowers operating costs over the life of the monitor.They have a built in PC, big deal! RS232, RJ45 and HDMI CEC connectivity enables IT managers to manage the display remotely.CEC is very much a technology for the home-user in my opinion, RS232 and RJ45, you guessed it, the TouchIT LED has these too! Dare I say it? Ok, I will. From what I can see here, there is nothing new about this product. Its an expensive 75″ LED, on a mobile stand with a built in PC, and don’t forget the 20pt multi-touch. If you are looking for a product for your classroom, that is $2000 cheaper, arguably comes with better software (as we have no details whatsoever about what Dell is supplying) then look no further than the TouchIT Y Series, from TouchIT Technologies. We’re more than happy to setup a webinar or an in person demo and send you a quote, just get in touch and let us know your requirements. We have stock and won’t keep you waiting until May!